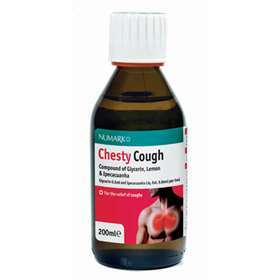 Numark Chesty Cough compound of Glycerin, Lemon and Ipecacuanha is taken for the relief of coughs. Glycerin 0.5ml and Ipecacuanha Liquid Extract 9.8mcl per 5ml. Take 5 to 10ml, 3 to 4 times a day. Not more than 4 doses should be taken in any 24-hour period. NOT RECOMMENDED FORM CHILDREN UNDER 12 YEARS OLD. you are allergenic to any of the ingredients, have kidney, liver or heart problems, are pregnant or breast feeding unless on the advice of your doctor. If you are taking other medicines, check with your doctor or pharmacist before taking this medication. Ipecacuanha liquid extract may interact with antiarrhythmic drugs. If you have been told by your doctor that you have an intolerance to some sugars, contact your doctor before using this medicine. Contains 3.2g of sugar per 10ml dose. Contains sucrose, ethanol, E123, E214, E216 and E218.